Patriot One Technologies Inc (TSXV: PAT) is a company in a sector that we wouldn’t typically cover. However, with the recent emphasis on security Patriot One is a company that is impossible to ignore. This is further exemplified by the bullish action investors have had towards the stock. Patriot One’s claim to fame is through proprietary technology in which it has licensed from McMaster University. The technology is focused on increasing security in public places, such as schools, places of worship, airports, theatres, and so on. It provides this increased level of security by detecting potential weapons through the use of radar technology. Essentially, as a person walks by the companies device, the unit scans for known signatures of potential weapons such as guns or knives. This information is then relayed back to a user interface, wherein an operator can act accordingly. This technology has been well received by the market as a result of recent global events. The company has been featured on a number of different mediums, including the Discovery Channel’s Daily Planet, as well as Fox News. The share price has reacted accordingly, with the value of the company increasing at a rapid rate. Due to the bullish action on the equity, we decided to give investors a quick thirty second run down on the company. In terms of what is to be expected from Patriot One for future sales, this outline of the companies product and service portfolio was provided in the latest MD&A that was filed at the end of December. Patriot One’s anticipated revenue streams. Snippet from MD&A filed on December 28, 2017. Essentially, Patriot One intends to sell its hardware to distributors who will then supply the product to customers. This hardware will result in the company recording roughly $10,000 in revenue per unit sold. Costs on a per unit basis were not provided by the company. Furthermore, it is unclear if the company will be involved in any aspect of the installation to verify the products effectiveness. In addition to the product itself, the company will also be providing two services to its clients. The first of which will be a monthly subscription service which ensures the latest software is available for currently installed units, including the latest weapon signatures. The company will also provide security related consultancy services. Although revenues haven’t been recorded as of this reporting period, a pipeline does exist according to the company. In addition to this, an installation has already occurred at a resort in Las Vegas, which is being utilized for development and testing purposes. As per the company’s timeline, the commercialization of the product was not due to occur until the fourth quarter of 2017. It is believed that the company is roughly in line with this projected timeline based on the data available. Patriot One’s recent update regarding sales and marketing. Note the stated backlog currently existing. As of the latest update from the company, there is currently a backlog of 453 units that have been committed to clients. The company also states that thirteen agreements are in place, however it does not detail if these are related to providing the product or providing a subscription based service. With as much optimism we have for the company, we need to be clear. As of the latest filings by the company, they haven’t recorded any revenues. The last filing is as of October 31, 2017, representing the companies first quarter of 2018. Patriot One Technologies revenues for quarter end October 31, 2017. Although revenues were non existent for the quarter, they managed to keep their expenses relatively in check. The largest expenses recorded by the company are for further research and development ($464,091), as well as for personnel costs ($497,389). Aside from these two line items, there were no excessive expenses recorded by the company. In reference to that above stated backlog of 453 units that faces the company, we can anticipate roughly $4,530,000 in revenues for fiscal year 2018 as a baseline figure. This does not include potential subscription services for the units, which can be up to $500 per unit installed. It is likely that this figure is greatly reduced if a client has multiple units installed. Given the fact that commercialization was just achieved, we can likely expect these backlog numbers to increase, based on manufacturing constraints. The share structure of Patriot One Technologies is in a relatively decent condition. Currently, the biggest factor in its structure is the outstanding derivatives for the company. These will likely provided a bit of selling pressure as we progress through 2018. 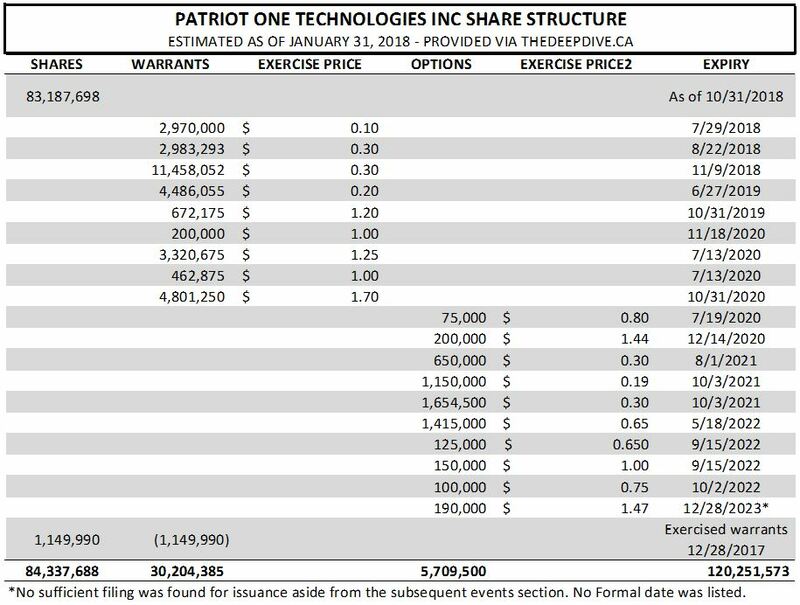 The estimated share structure of Patriot One Technologies as of January 31, 2018. As it currently stands, it is estimated that roughly 30.2 million warrants are outstanding for Patriot One. Roughly half of these warrants have an expiry in 2018, and are therefore likely to cause some selling pressure as their expiry date nears. In addition to this,there are 5.7 million options outstanding, however none of these expire for at least two years. As it stands, all derivatives are currently well into the money. 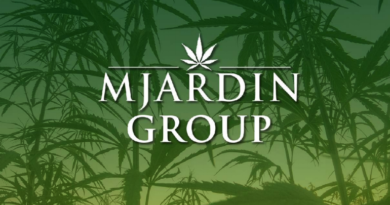 Based on the estimated outstanding share count of 84,337,688 units, the market valuation based on the closing price of $2.40 on January 30, 2018 is $202.4 million. With the estimated fully diluted count at 120,251,573, the fully diluted market cap is an estimated $288.6 million. Overall, we like what we see when it comes to Patriot One Technologies. They currently offer a product that is undoubtedly in demand as a result of current global security issues. With an increasing rate of mass shootings occurring in the United States, the demand is – unfortunately – only set to increase for such a product as high target facilities look to increase their level of security. In terms of the company itself, based on what we have seen it simply needs to increase its manufacturing ability. The company is well aware of this however, and has put agreements in motion to resolve this issue. Development costs will also continue to be present as Patriot One looks to increase the size of its database to include a larger number of potential weapons. Based on what we have found in our Deep Dive, this company may have some excellent future potential for growth. Look for companies in emerging sub sectors that offer something unique. Determine the viability. Dive Deep. Information for this analysis was found via SEDAR, TMX Money, Wired, The Washington Post, Security Today, and Patriot One Technologies Inc. The author has no securities or affiliations related to this organization. Not a recommendation to buy or sell. Always do additional research and consult a professional before purchasing a security.